Volunteering with Georgia Strait Alliance is a great opportunity for you to make a positive impact in your community, be part of a team, share your experience, learn new skills and develop lasting friendships. Volunteers are the lifeblood of our organization and we wouldn’t be able to help preserve and protect our coastal waters and communities without you. As a non-profit organization, our work is limited by our funding. Volunteers take us beyond those limits! Our volunteers support our mission in countless ways. One day you might find yourself manning our table at a Vancouver Canucks hockey game or other event; another day you’ll be helping at one of our Waterfront Initiative forums. You could also become part of our Clean Marine BC team. We know one thing…you’ll have fun while helping us protect our precious marine environment! We hope you’ll get involved. 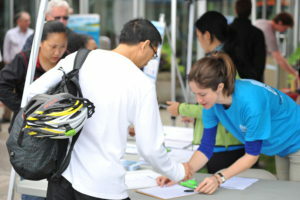 Sign up as a new volunteer and join the Georgia Strait Alliance team today! What are your interests? What is your availability? Join our community and get timely info on important issues and actions needed to protect our waters! Georgia Strait Alliance does NOT lend, trade or release contact information to any other organization or individual. Marine species are at risk in the Strait. Your donations help GSA to protect their critical habitat. We’re only here for a relatively short period of time in terms of ecosystem developments. As custodians, it’s our job to protect what we have and Georgia Strait Alliance is taking a strong leadership stand on regional issues and making that happen. © 2019 Georgia Strait Alliance. All rights reserved.